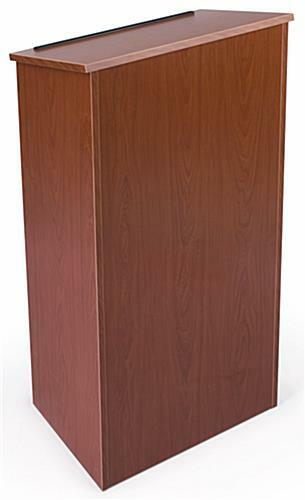 This cherry collapsible podium is made of durable MDF with a rich natural-looking laminate finish that will withstand heavy use. 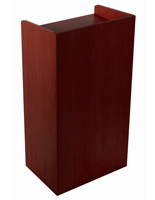 Each portable speaker's stand is 45" tall and 23" wide when assembled, and comes with a phillips-head screwdriver for easy assembly. 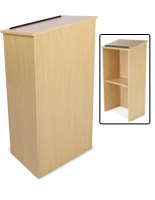 This wood-look collapsible podium with scratch-resistant laminate finish is idea for use in educational, religious, and institutional facilities, as a shared conference fixture, or at trade shows and other promotional events. 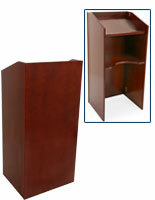 This full size MDF lectern's simple design can be put together by one person without assistance. 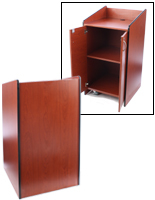 This easy-to assemble laminated podium with a rich red finish is designed for maximum stability during use. 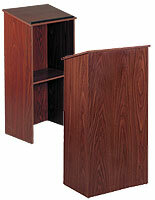 This useful pulpit includes a slanted reading surface with a built-in book stop to hold lecture, sermon, or presentation materials. 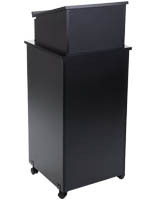 This versatile collapsible podium also features an open-back design with an internal storage shelf for supplies, personal items, or speech accessories. 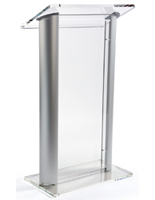 This elegant looking portable MDF laminate lectern stand is an economical alternative to solid wood or veneered speaking furniture. 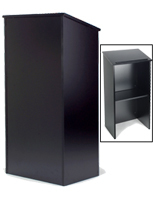 23.0" x 45.0" x 14.8"
When we received the podium the outside packaging looked fine, but when we opened it, the top point of both side pieces was broken. We glued them together and assembled it. You don't notice it was glued. 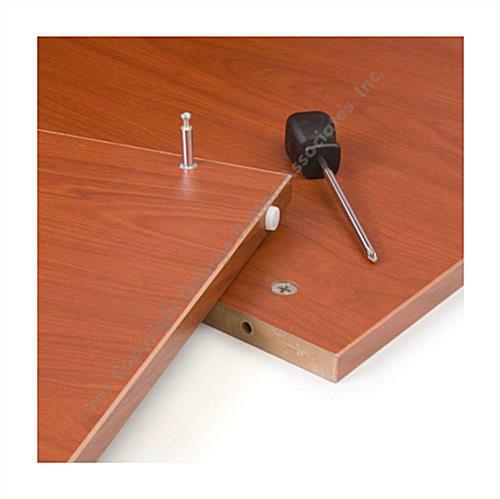 Apparently the damage occurred prior to packaging the item. 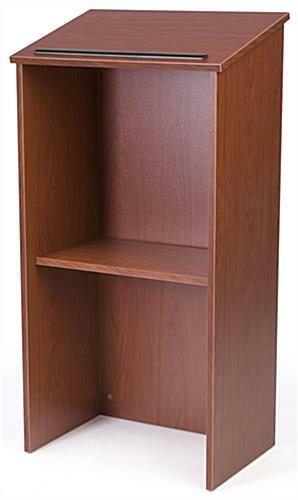 This podium has a nice looking finish and was easy to put together. 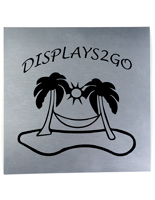 It did arrive within the 2 day ship time.